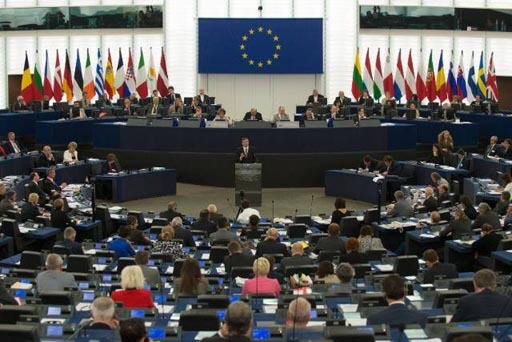 In the Strasbourg EU parliament today, José Manuel Durão Barroso, President of the European Commission, gave what he likes to call the "State of the Union Address", abbreviated as "SOTEU". The parallels with the US presidential address are so obvious that there could be no better illustration of the broader ambitions of the "colleagues". The full text of the speech is here, more than five thousand words that took forty minutes to deliver. Different commentators will come up with their own summaries, but there is some accord as to what was the core of the speech. "In the debate that is ongoing all across Europe, the bottom-line question is: Do we want to improve Europe, or give it up? ", says Barroso, answering his own rhetoric in predictable fashion: "My answer is clear: let's engage! If you don't like Europe as it is: improve it!" That, effectively, is the siren call of the europhiles throughout the ages, and exactly the line taken by our own prime minister, David Cameron. And, in Mr Barroso, he has the perfect ally, who could be speaking directly to No 10, when he added: " Find ways to make it stronger, internally and internationally, and you will have in me the firmest of supporters. Find ways that allow for diversity without creating discriminations, and I will be with you all the way. But don't turn away from it". I value subsidiarity highly. For me, subsidiarity is not a technical concept. It is a fundamental democratic principle. An ever closer union among the citizens of Europe demands that decisions are taken as openly as possible and as closely to the people as possible. What we then saw was classic Commission dissembling, as Barroso presented the reasonable face of integration, telling us: "Not everything needs a solution at European level. Europe must focus on where it can add most value. Where this is not the case, it should not meddle. The EU needs to be big on big things and smaller on smaller things - something we may occasionally have neglected in the past". So, Mr Barroso, after all, would allow us mere mortals to decide on the colour of our dustbins, while he, the Great Leader, got on with running the big show. Then, he conceded: "The EU needs to show it has the capacity to set both positive and negative priorities", he said. "As all governments, we need to take extra care of the quality and quantity of our regulation knowing that, as Montesquieu said, les lois inutiles affaiblissent les lois nécessaires. [Useless laws weaken the necessary ones.]" Tucked in there is what amounts to an admission, one that will be glossed over by most commentators, who will fail to recognise the significance: "As all governments …". The EU is not a state, much less a superstate. It is a government, and Mr Barroso is very well aware of that. In fact, it is our supreme government, a super-government if you like. I believe a political union needs to be our political horizon, as I stressed in last year's State of the Union. This is not just the demand of a passionate European. This is the indispensable way forward to consolidate our progress and ensure the future. Ultimately, the solidity of our policies, namely of the economic and monetary union, depend on the credibility of the political and institutional construct that supports it. So we have mapped out, in the Commission Blueprint for a deep and genuine Economic and Monetary Union, not only the economic and monetary features, but also the necessities, possibilities and limits of deepening our institutional set-up in the medium and long term. The Commission will continue to work for the implementation of its Blueprint, step by step, one phase after the other. And I confirm, as announced last year, the intention to present, before the European elections, further ideas on the future of our Union and how best to consolidate and deepen the community method and community approach in the longer term. That way, they can be subject to a real European debate. They will set out the principles and orientations that are necessary for a true political union. Some less knowledgeable commentators expected more, with Matthew Elliott, self-styled Chief Executive of Business for Britain, wrongly predicting that Borroso would "start to expand on his vision of banking and fiscal union, welding the countries of the Eurozone ever closer together into a new highly-integrated economic bloc". But that was never going to be. The Commission President had long ago flagged up that he was gong to reserve that treat for the run-up to the elections in 2014, kick-starting the process that will inexorably lead us to a new treaty, at the earliest by 2018. This is exactly the point picked up by Die Welt, telling us that the Commission ideas will be released before the 2014 European elections. Any serious commentator would have known that Barroso was not going to say anything which frightened the horses with a German election campaign in full spate. It is thus in early spring that the Commission intends that the "real European debate" should start, rendering other efforts rather less impressive. The die is already cast, the timetable has been set and the agenda already written. Soon enough the "little Englanders" will realise this, whence they will learn that they are not in control. The POTEU has spoken.